One of the keys for rocking roofing SEO is to make sure you cast a wide net of efforts to help search engines like Google see your business as a prime candidate for those coveted top search result spots. For this reason, many busy roofers hire a web marketing team (like us) to manage these ongoing efforts to perform better in the highly competitive space of local search engine optimization. But it’s still vital that you stay in the loop on what is happening across the web on your behalf so that you better track leads and help steer efforts to grow your client list. Roofers that utilize Off-Page SEO (or “off-site SEO”) are going to see the benefits of multiple entry points for website traffic and lead generation, so let’s dive into those for today! The webpages and blog posts that seem to rank really well for roofing queries are utilizing what is called “on-page SEO.” Without seeing all the work behind the scenes — such as schema markup and keyword optimization — I know that these pages employ these methods because they wouldn’t rank well if they didn’t. Using strategy to best format and develop a page of content to perform well on Bing, Google, Yahoo, etc. is what will allow a page of content from your website or blog (both under the same domain as a best practice) stand out from the pack in an oversaturated market, content-wise, like roof repairs. Off-site SEO, on the other hand, is the detailed work that takes place outside of your primary website and blog. These are citation listings (or home service directories, as they’re known too), social media pages, online review sites, and pretty much anywhere else your business name is represented. Even doing a guest blog post about the services you offer (in the vein of content marketing for roofing) is considered off-page SEO because it promotes your business (literally and figuratively in the rankings) without originating from your professional site. We’ll talk specific tips to improve the latter for your company, but just remember that off-site SEO is internet marketing that takes place outside of your main website (hence the name). Building backlinks to help establish your website as authoritative and user-friendly is a huge way to boost your Google ranking. But it also takes a lot of work to make that happen. There are shady ways to make this happen, but harnessing the power of organic linking not only catapults your webpages but also further helps differentiate your roofing company in a sea of roofers. The single best way to get links to your website (including blog posts) is to write fantastic content that is highly linkable. Duh. But what does it mean?! Creating pages and posts that offer a solid and unique perspective on roofing repairs and the services you offer are going to naturally appeal to potential customers looking for help for their home or business (if you include commercial roofing services). When other sites or companies who value the information you’re putting out there link to your content and/or share via social media or email newsletters, you’re going to get some pretty great link love. Especially if you have a newer domain, which means your website just recently launched and you, therefore, don’t have the domain authority and age associated with your URL to hit the top spots, intentionally seeking some quality links is a great strategy. Trade associations, unions, fellow home service providers (who aren’t competitors, of course), and even realtors are great resources with whom to share posts and webpages you’re trying to optimize. But bear in mind, you have to ask. Don’t be passive and just send the link with a casual, “Just FYI.” No, ask them to link to your page from a specific spot on their website, social media presence, etc. Know what you’re asking for, be specific and direct, and you’re far more likely to get what you ask. This adds outbound links to their content, too, so it’s mutually beneficial and opens the door for a “you scratch my back, I scratch yours” relationships that could really get your phone ringing. It should go without saying that you shouldn’t tarnish your reputation by asking for links to crap. If the content marketing for roofing that you’re publishing is sub-par, you’re wasting your time. There are a gazillion posts out there about roofing. If you want your webpages to be seen by more than a handful of people, it needs to be unique, done exceedingly well, and promoted by folks who recognize the awesome work you (or your content writers) have done. If you do a quick search of your roofing company, you’re likely going to find that you show up all over the place. This is great! The thing of these as “ins” that you can maximize, and remember that each and everyone is a potential referral source. Of course, you should always prioritize efforts and make sure that the top ranking citation sites are getting your attention first. Claim those listings whenever possible, and make sure that you’re putting a personal touch on every home services directory that allows it. Citation Content Is Still Content…Work It! The top priority is making sure that the NAP information — name, address, and phone number — listed on all the directories in which you are listed on the first few pages of the SERPS is correct. That’s an easy lead source that simply needs a moment to verify the accuracy of the contact information so you don’t miss calls due to an innocent typo. Google is without question the search engine giant, so that’s why you’ll hear them called out over and over again from us. 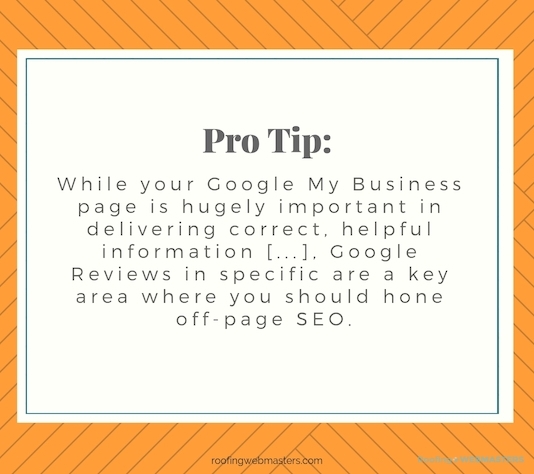 While your Google My Business page is hugely important in delivering correct, helpful information to homeowners looking for roofing repairs in your service area, Google Reviews in specific are a key area where you should hone off-page SEO. Getting reviews, in general, is highly beneficial in a consumer market where feedback and public opinion is valued (and it is). In particular, Google Reviews are tied directly to the pinnacle of internet marketing success, so let’s work that resource for all it’s worth! If your online review strategy in the past has focused largely on HomeAdvisor, Yelp, or any other citation page, that’s OK. In fact, cheers for having intentionally chased those reviews to build up your business. But now make a concerted effort to drive reviews to Google, as the volume can improve your rankings, as well as provide a nice cushion for the inevitable mediocre (or even bad) review. Even the most customer service-oriented businesses can be hit with a sub-par review. You haven’t failed, nor should you launch into a full-scale counter-attack. Take a deep breath, know that this is something business owners have had to deal with since the dawn of time (though in different forms, pre-internet), and put on your professional pants. Taking the time to acknowledge and respond to poor reviews with grace, humility, but also confidence in the roof work you deliver is everything. You can easily counteract a negative comment (in fact, the more negative, the more viewers will dismiss it as unreasonable, to begin with) with a steller response, and this can even invite more reviews and speak highly to your character as a businessman/businesswoman. Don’t stoop, don’t bicker, and don’t give away the farm. Contemplate a fair response, get counsel from a mentor or partner if needed, and move on. Job well done!